Senate Republicans have updated their bill banning sanctuary cities in Texas to cover college campuses and expand potential punishments for local entities that choose to not enforce immigration laws. Ahead of a hearing on the measure that is expected to draw hundreds, Senate Republicans have updated their bill that would ban sanctuary cities in Texas to cover college campuses and expand potential punishments for local entities that choose to not enforce immigration laws. 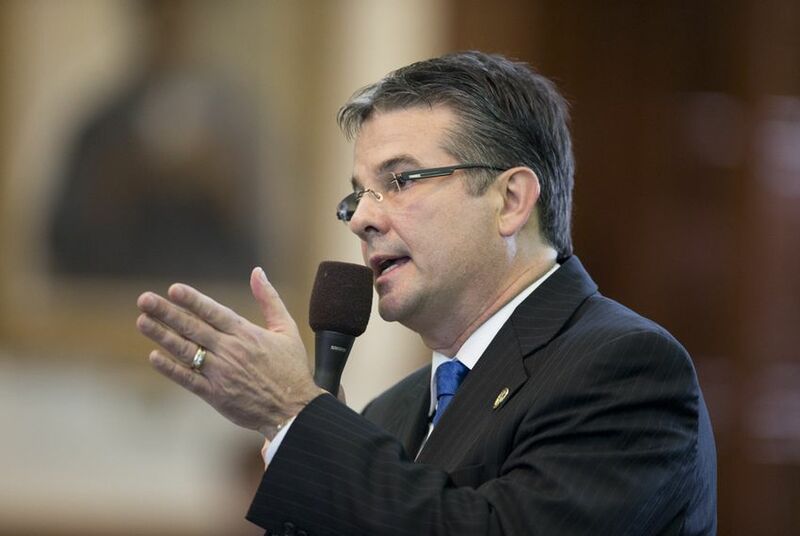 The modified version of Senate Bill 4, by state Sen. Charles Perry, R-Lubbock, was given to members of the Senate State Affairs Committee Tuesday, and a public hearing on the proposal is scheduled for Thursday morning. On Tuesday, Gov. Greg Abbott declared the issue one of four emergency items of the session. That designation means lawmakers could debate and pass the bill within weeks rather than adhering to the traditional 60-day waiting period to hear bills on the floor of either chamber. Sanctuary policies refer to entities — such as cities, counties or colleges — that do not comply with federal immigration law. Perry’s bill would allow local police to enforce immigration laws but only if the officer is working with a federal immigration officer or under an agreement between the local and federal agency. It would also punish local governments if their law enforcement agencies — specifically county jails — fail to honor requests, known as detainers, from federal Immigration and Customs Enforcement officers to hand over immigrants in custody for possible deportation. The punishment would be a denial of state grant funds. Perry said the college campus provision was added to the legislation after some student groups called for their schools to become “sanctuary campuses” to protect undocumented students. “The college campus aspect was needed because we’ve had a lot of rhetoric from some of the college campuses [saying] this is what we’re going to go out and do,” Perry told reporters during a press conference. But Perry said campus police officers wouldn’t be in charge with adhering to federal law because students would be turned over to local authorities. The bill was also changed to include a top-down provision that would mean a local government could jeopardize funding for every agency under its purview if it adopted a sanctuary policy. “An entity in violation loses their state grant funds and every entity under their jurisdiction will lose funds as well,” a summary of the modified bill reads. Perry's revisions come as Abbott on Wednesday made good on earlier threats and cut off state funding for Travis County over a new "sanctuary" policy implemented by Sheriff Sally Hernandez. In the House, state Rep. Charlie Geren, R-Fort Worth, filed a companion bill to Perry’s original proposal. It’s unclear however, whether House members will be on board with Perry’s changes. As of Wednesday morning, Geren’s bill hadn’t been modified from its original version. Perry's press conference concluded about an hour before several dozen opponents of the legislation arrived at the Capitol for a day of action that included a prayer service and visits to lawmakers' offices. Bob Libal, the executive director of watchdog group Grassroots Leadership, said Perry's bill opens the door to local leaders being bullied by the state's leadership. "Threats to localities that are trying to do right by their residents is a big problem," Libal said. "It threatens to make our communities less safe." Libal also said that demanding local entities comply with ICE will lead to mass deportation that would also sweep up nonviolent offenders. "We can safely assume that we [will be] back to the peak numbers because of this program," he said. The UT-Austin chapter of the League of United Latin American Citizens (LULAC) also plans to protest Perry's bill during Thursday's public hearing, according to a chapter spokesman. Among the group's concerns: Giving campus police the power to enforce federal immigration laws could mean they can question lawfully detained students about their immigration status, potentially subjecting undocumented students to ICE collection and deportation. Although Perry's bill excludes witnesses to or victims of crimes from being subject to immigration inquiries, some law enforcement officials argue the bill will deter the public from cooperating with law enforcement. "I join many Sheriffs and Police Chiefs from the great State of Texas who vehemently oppose Senate Bill 4. This bill is unnecessary and only serves to fulfill the anti-immigrant rhetoric of certain politicians," El Paso County Sheriff Richard Wiles said in a statement. "This bill would tear down the trust and positive relationships between law enforcement and the communities they serve, resulting in an increase of crime and victims." Perry said during his news conference that the public-safety argument can also swing the other way. "Think about the logical conclusion: Immigrant communities are going to be reluctant to go tell on someone that’s in their community that has does bad things," he said. "Had we not had a sanctuary city policy that probably allowed that individual to go in to that community in the first place, would that individual have that need to be fearful?" Gov. Greg Abbott followed through Wednesday on his threat to cut off state funding for Travis County over its new "sanctuary" policy.